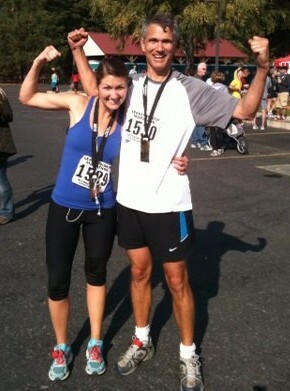 My daughter, Allison, and I ran the Leavenworth Oktoberfest Half Marathon last Saturday. I enjoyed the race, but the greater joy was spending the day with my adult daughter. I drove over to Leavenworth Friday afternoon and found a camping spot and set up our tent. Allison arrived around 6:30 and treated me to a delicious pasta feed – spaghetti with marinara sauce at Pizza Company. After we walked around town we headed back to camp and went directly to bed. Allison expected to be cold, but she was warm enough in a heavy quilted sleeping bag and a couple extra blankets. After breakfast, we drove ten miles to the start of the half marathon. We approached the entrance from the mountain side, not the town side, so we did not have to wait in line like most people. Once the sun came up, it was a beautiful day, except for some lingering haze from the forest fires that have been burning the past couple months. The temperature was cool. I elected to wear short sleeves and Allison went with long. As the start time approached the several thousand runners and friends chatted nervously, stretched, and made last minute rest room visits. Finally, the announcer gave the two minute warning. The tension increased. We studied the small start tunnel that we had to file through to begin the race. Many of us wondered if we had what it would take to cross back through that tunnel after completing 13.1 miles. Because I expected to run faster, I started ahead of Allison and I was delighted to see her twice where the course cut back. Both of us felt good and held a steady stride throughout the race. Allison finished 20th out of the 210 racers in her division with a time of 1:45:35 and I finished 4th out of 31 in my division with a time of 1:38:11. Even though my time was faster, Allison finished higher in her division than I did. She was in the top 10% while I missed that mark. I also missed getting a medal by 55 seconds. After the race we agreed, “We came. We saw. We conquered!” We had a wonderful time. We learned some things. And, most importantly for me, I had a wonderful father-daughter adventure. In his sermon at Whitworth Community Presbyterian Church yesterday, Dr. Keith Tanis expertly communicated the value of healthy routines. At the end of his sermon he foreshadowed that next week he is going to talk about risk. I have already been learning about routine and risk as I gear up to run a half marathon with my daughter Allison. Last spring Allison began urging me to enter the Leavenworth Oktoberfest Marathon with her. I was reluctant. The cost seemed high to me. Preparing would take a lot of time and I did not want to risk an injury. Nevertheless, she prevailed and I allowed her to register me for the race. I know that the risk will be worth it. I look forward to a wonderful weekend with my daughter immersed in the spectacular beauty of Leavenworth, WA and I enjoy challenging my body to a higher level of fitness. Now I am preparing. To be a good runner, you must run. To run 13.1 miles in a race, you should prepare for 10 to 12 weeks. The training schedule I am using begins with three mile runs the first week, stretches to four miles the second week, and increases the distance each week until two weeks before the race. This week, four weeks before the race, I will run 4 or 5 miles Tuesday, Wednesday, Thursday, and Saturday and 11 miles on Sunday. Yesterday I ran ten miles. Along with the value and benefits of routine and risk, I have been learning that rest is also significant in preparing for a race. The training schedule includes two days of rest each week. Two days to allow your body to recover from the pounding it endures the other five days. It is particularly important to rest the day after a long run. So, I am taking today off to allow my muscles and joints to recover from yesterday’s ten mile run. It is not surprising that Paul compared spiritual development to running a race. (1 Cor 9:24, Gal 2:2, Gal 5:7, 1 Tim 4:7) He recognized the parallels between running a race and growing to spiritual maturity. To become mature in Christ we must walk by faith, which appears risky. We must establish routines of Bible study, prayer, and other spiritual disciplines, and we must get sufficient rest to be renewed for the next step of faith. The Singh family, Artaj and Judy, allowed us to turn their beautiful home on the Niagara River into the wedding headquarters. They hosted many night-guests and even more day-guests. The served many meals. They provided counseling and local information. Their availability saved us a lot of money, but what they gave us was far more than money could buy. The Green family, Tim, Bethan, Ffion, and Mererid, from England, arrived several days early and added much needed expertise and manpower in preparing the venue. I especially appreciated the fun and laughter they brought to the process. Then Tim provided a wonderful sermon during the wedding ceremony! Bridesmaid Catherine Hamilton graciously self-assigned herself to the “director” role Friday and Saturday after she observed that the Fritz family was no longer effectively self-directing. Her competence was immediately evident and we spontaniously and gratefully responded to her leadership. Then entire wedding party worked together doing everything from preparing the flowers to protecting the bride from too much stress. Photographer, Amy Birdsong, proved her professional competence as she herded us for pictures and made it fun! I can’t wait to see her pictures. Videographer, JP Young, unobtrusively captured the event on video. Again, I can’t wait!! Peter Hedlund did an amazing job as event disc-jockey! His timely choice of songs made the reception memorable. Literally dozens of people spontaniously helped with set-up and tear down and in countless other ways. Almost everyone traveled a significant distance to come. Many people crossed an international boarder, some traveled from distant continents. Every attendee helped make the ceremony special. Many people contributed to make the day special. Thanks to each and every one! Twenty-six years ago yesterday, my daughter Allison was born. At that time our family was part of a small intentional community in Northwest Pasadena, California. Our community lived in a large 80-some year old Victorian house. We shared space, meals, chores, joys, and sorrows. Many of us intended to live and minister overseas and we knew that one of our most difficult challenges was going to be getting along with our colleagues. The purpose of our community was to learn how to live and communicate while living in a relationally intense situation. Allison is a lovely and lovable adult, but she was a challenging baby. There were days when we were both at the end of our ropes. Fortunately, at that time we had an young African man living in our community house. Otu was the oldest of a large family and he knew how to care for a discontented baby. When Allison was inconsolable by Nancy and me, Otu would take over. He held her over his head, her tummy in his large palm as he rocked her and repeatedly sang in his native language, “Ki ki kaa di. Ki ki kaa di.” That never failed to calm her. One of the benefits of living in community is the availability of skills, knowledge, and giftings of the members. 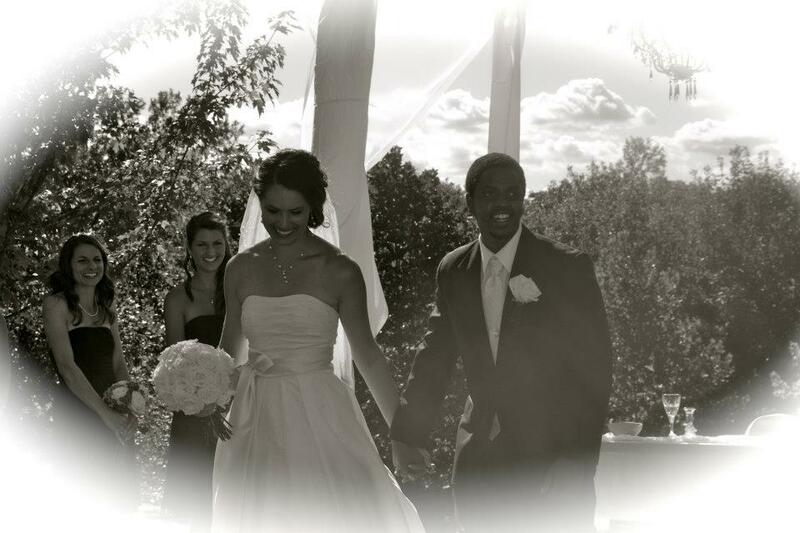 To this day I am grateful for Otu and the rest of the people who helped our family get started. Nancy and I were blessed to have our daughter, Allison, visit us over the weekend. It is a significant sacrifice for her to visit us as it is a five hour car trip from her home in Bellevue to our home in Spokane; that is when I-90, including Snoqualmie Pass, is clear. Yesterday, during her trip West the pass was not clear. We checked the on-line report before she left and thought that she would not have trouble. However, somewhere around Moses Lake, Allison saw an alert that chains would be required for her to make it over the pass. Her first instinct was to call me. During the rest of the evening we communicated back and forth. As I sat in my comfortable warm house, I thought about what real value I was adding to Allison’s situation. Why was it important to her to have me involved? I was not able to offer any physical help. I know how to purchase and put on car chains, but I could not do it for her. I was not there. Also, due to my physical distance, I could not directly assess her situation and I refused to make decisions for her. She was responsible to gather data and chart her course. So, what value was I adding that made her continue to call me during the next couple hours as she walked through a stressful set of circumstances? After discovering that she needed chains, she decided to keep going. She stopped in Ellensburg and bought chains. She drove on to the pass. Pulled over in the dark and, after recruiting help from strangers, got the chains on. Drove over the pass. Again pulled over in the dark and took the chains off by herself. And, finally safely arrived safely in Bellevue. What real value was I able to offer? Vicarious courage. My simple words of encouragement increased her chances of success. Three or four times she felt like giving up. Each time I said, “You can do this.” She believed me and pushed on. Before long, she was through the stress and safely on her way. I don’t mean to take away from the courage she demonstrated. She was very brave throughout the evening. In fact, one way she expressed her courage was to acknowledge she did not have enough and she asked/allowed me to vicariously make up the difference. Recognizing this cause me to look for others who need vicarious courage. Who else can I encourage with a, “You can do it!” I want to be the kind of leader who helps those around me succeed by offering them moral support.